The purpose of this thread is to provide a place to discuss all things Sanae Dekomori related. To keep the discussion enjoyable for all Chuunibyou fans, please follow the guidelines below and stay on-topic! Dekomori is currently my favorite character for just being so much fun. She brightens up every single scene she's in and her voice is also very addictive to listen to. And unlike Rikka, I think she has yet to break out of her Chuunibyou mode. Hopefully we get to see much more of her. And I find the moustache-shaped fringe adorable. Who can't love her DESS? At first I didn't like her at all, slowly her crazy antics are getting to me. Her pairing with Nibutani is always hilarious... More so when Nibutani sees her as her younger self and is more annoyed at her... but she's also cunning (compared with Rikka at least) which makes for some nice and comic encounters. Anime only material of this quality I'm not against. Maybe I'm thinking too much into it, but when Sanae revealed to be very bright somehow it got me thinking that her chuunibyou stems from the "loneliness of being on top", or something like that. I actually think that's very likely the case. Since she is so smart such that she's leap frogging her classmates academically, she probably wanted someone to talk with either on an equal level or where she is inferior for once. Or maybe that because she's smart she has faced pressure from others (parents and teacher perhaps) to act mature but she probably doesn't like it (probably missing out on the happier times of remaining childish). The fact that she likes to announce that she's the servant of Rikka says a lot about that angle too I think. 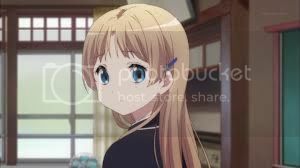 I hope we get an episode dedicated to Deko-chan later on, she (and Kumin) seems to have a lot of holes left to be filled in terms of their background. We all know that Rikka will get her backgrounds revealed so just hope these two won't get left behind. I am thinking does she really think Nibutani is the fake mori summer or is she just screwing with her to bring her back into the chunnibyou world. I think its unlikely she will mess with a non chunnibyou person. Her interaction with Nibutani is quite interesting but still behind Rikka and Kumin. I also worry about the way she keeps abusing her hair. Hair is pretty strong but spinning it and using it as a weapon is somewhat overdoing it. I think Sanae is well onto Shinka, and is purposely trolling her to get her to accept her alter ego. Sanae has continuously been entertaining throughout the series, but the latest episode shows er with a good amount of depth. I see your HNNNNNNGGGGGHHHH pic and I raise you another. bishoujo-mode Dekomori is very HNNNNNNNNNNNNNNNNG-worthy indeed. So, Dekomori owns a Mercedes, has a chauffeur to drive it around, and looks adorable without the twin-tail nunchucks.